NEW YORK - Junior welterweight world titleholder Terence Crawford uncharacteristically lost his cool during the stare-down after the final news conference with "Hammerin'" Hank Lundy on Thursday when he shoved the trash-talking challenger. But he was calm and cool as he dissected Lundy before scoring a punishing, fifth-round knockout on Saturday night before a sold-out crowd of 5,092 at the Theater at Madison Square Garden. Crawford retained his 140-pound title for the second time and was quite satisfied to shut up the mouthy Lundy. Hank Lundy was aware of what he was doing. He knew the consequences involved. All week, as he spewed trash talk at Terence Crawford in an attempt to unnerve him, Lundy knew he might be providing ammunition to a fighter who was already heavily favored and one of the top talents in all of boxing. It turned out to be a poor strategy. Crawford took a round to figure out Lundy and once he did, switched to the southpaw stance and dominated his shorter opponent, dropping him in the fifth round with a left and stopping him moments later at 2:09 of the stanza to defend his WBO junior welterweight title Saturday at Madison Square Garden’s Theater before an announced crowd of 5,092. Afterward the two embraced, with Lundy finally giving Crawford his due. “Much love and good fight,” Lundy said. Crawford (28-0, 20 knockouts) did the same for Lundy (26-6-1, 13 KOs). Terence Crawford reminded everyone why he’s one of the world’s best boxers today; Felix Verdejo dominated but didn’t thrill with his victory. 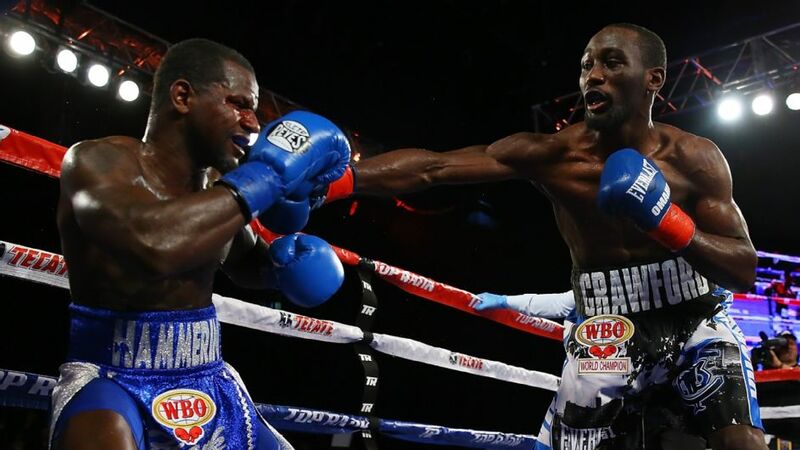 SAN DIEGO, February 27, 2016 – Super lightweight Terence Crawford (28-0, 20 KOs) had little trouble with Hank Lundy of Philadelphia (26-6-1, 13 KOs) of Philadelphia, stopping Lundy for only the second time in his professional career. The pride of Omaha, Nebraska made his debut at the Theater at Madison Square Garden and put on a clinic against the tough Lundy. Crawford demonstrated his ability to be patient, waiting for the opportunity to unleash his power punches when he can make them count. Lundy came to fight, and landed clean shots on Crawford in the first round. Crawford is never one to panic, and came out in the second round ready to go to work. He switched to the southpaw stance, a favorite tactic, and as it does with many of his opponents, it threw Lundy off and kept him on the outside. When Crawford switches back, it renders the opponent unable to close any distance, never knowing when Crawford might switch again. The result: a full plate of jabs, served ice cold. NEW YORK — Terence “Bud” Crawford was brought to New York to expand his marketability. Consider a sold-out crowd of 5,092 at the Madison Square Garden Theater now in his corner. Crawford didn’t disappoint in his East Coast debut, stopping brash challenger “Hammerin” Hank Lundy at 2:09 of the fifth round to successfully defend his WBO junior welterweight title for the second time. The two-time champion from Omaha fought almost exclusively from a southpaw stance, staggering the challenger midway through the final round and dropping him with a left hand to the top of the head.